One of the Royal Guards who watch over Radiant Garden. 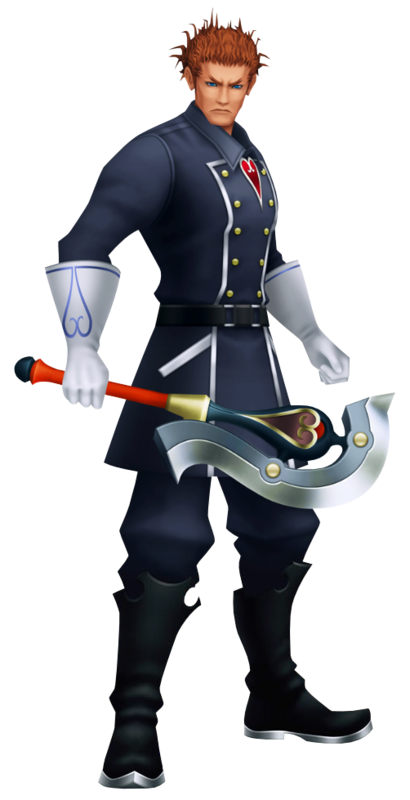 A stoic man who values action over words, he is also one of Ansem the Wise's apprentices. He was first shown guarding the palace at Radiant Garden with Dilan. The two met Ventus who tried to enter the palace, but the stopped him from getting inside. Aeleus noticed an Unversed and the two guards prepared to battle it, but Ventus chased after it first. Before they were able to run after him, Even appeared and asked who will defend the castle if they left their posts. Aeleus argued, still concernbed about the boy, but Even told them that Ventus could handle things becase he was "special case". Aeleus retorted, but Dilan reminded him that it was their job to guard their lord and the palace. Even also informed them that their lord was asking for them. After Master Xehanort was defeated, Aeleus was seen back at the castle gates while Dilan threw out Lea and Isa. Aeleus is a quiet and solemn man, but has more than enough strength to spare. He wields a blunt claymore and guards the gates of the Radiant Garden castle alongside Dilan. Although he doesn't look the part, he is in fact one of Ansem the Wise's six apprentices and studies with him diligently. Although he had surrendered his heart to follow the other students many years ago, he has returned a complete person and is caring for Dilan and Even in their poor conditions while assisting Ienzo in his search through the castle.